Right click Ego Database Editor.exe and select Run As Administrator. This tool will allow you to edit the database.bin file from various Ego Engine games. In the file you can edit tons of things like events, ai skill levels, teams and so much more. Convert -- Converts the bin file into easy to understand and organized datatables or xml file. Add/Edit Row Form -- New form that makes adding or editing much easier than before. Compare/Merge Databases -- Get the differences between two databases and merge those differences. Alternating Rows -- Puts color on every other row to make viewing easier. Filtering -- Allows you to quickly search each column and has the option to turn on and off certain columns. Column Sorting -- Lets you sort each column in ascending, descending or default order. Open With -- Associate the database.bin with this program, and simply double click to open from then on. To open a table for editing double click it. To close a table tab after editing press Control + T, select Close Tab from the Edit menu or double click the tab itself. 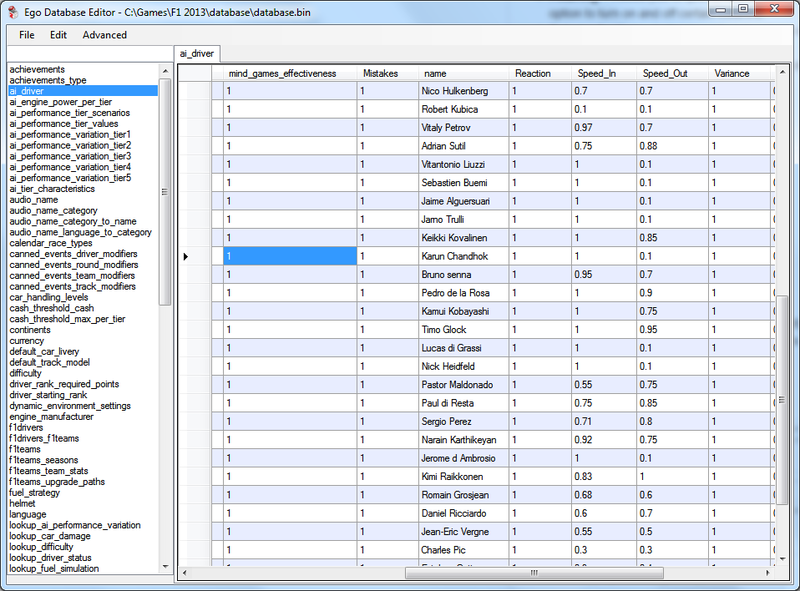 Right click the top left corner of a datatable to see a menu for turning columns on or off. Right click a column header to see a filter menu pop up for easy searching of items. When exporting as xml an xsd file is created along with your xml. Make sure to always have those two files together if you're going to send it to someone. Middle-Mouse-Clicking certain cells in a table will open the table that the column of the cell is associated with. 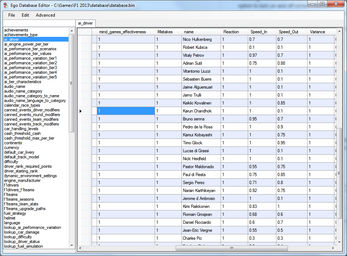 Double Click the top left corner of the datatable to view the main table. For rows with a drop down box, double click the row header to view the table that the dropdown box is associated with. To close tables double click their tab. After Opening a database, select the second database that you want to get the differences from. Once you get the differences, you can open the file separately to browse, or you can merge it to your original database. Rydiculous - For testing and giving suggestions. Shadow - For testing and giving suggestions. luh-koala - For making the program icon.